How many words do you know for twisting the truth? There are many more than the English words for truth itself! 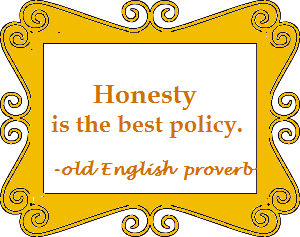 Learn the differences in feeling, formality, or exact meaning between the various synonyms for honesty, lying, and inaccurate information. At the bottom of the page there are some activities to practice different forms of these words and to rank them. See how many you can figure out! Lying (or “telling a lie”) is when a person says something he or she knows is false for the purpose of deceiving someone else (convincing them to believe something that isn’t true.) Someone who tells lies is a liar. 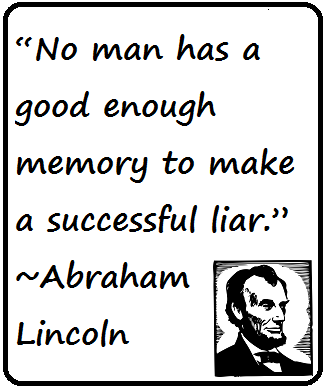 Most people have lied at some time, but lying can become a habit-- a way to try to impress others or to escape blame. A “white lie” is a false statement to protect someone’s feelings: “That dress looks great on you. It doesn’t make you look fat at all.” “Thanks for the great present! I always wanted...” (when you didn’t really want it.) It’s usually possible to find a way to protect feelings without lying, but sometimes it’s a lot harder. People can also be deceitful without actually lying. They can misrepresent the facts or imply (without actually saying) that something is true when it’s not. This is called misleading (or fooling, tricking, or deceiving) people. When you need a product or service like that, a friend might quote an old Latin saying: “Caveat emptor,” which means “buyer, beware!” Watch out for people who might “stretch” the facts or misrepresent what they are selling to make it sound better than it really is. If you have never seen anything like it before, or as good as he says, it is likely (probable) that he is exaggerating. To exaggerate is to make something sound bigger and better than it really is. There is an old Russian proverb that U.S. President Reagan liked to quote, which says in English “trust, but verify.” It’s wise advice. Since this page was first written, the idea of "fake new" has become prominent. Fake news can of course be falsehoods-- invented or twisted stories presented as if they were news. The term is also sometimes used for news reports the speaker does not feel are fair. I just read a very interesting Smithsonian article about the long history of fake and falsified news, including the way several of the U.S. Founding Fathers felt about it-- and why most felt the first amendment was important, even when they were the ones being unfairly criticized. If you are interested in journalism, politics, or American history, it's worth reading, or at least skimming. It's long, but the English is clear and simpler than many articles. It will be easiest to do these exercises on a piece of paper. You can just put the letters in order, and write the numbers for each entry in the tables (as well as filling in the blanks) if you don’t want the practice of copying every word. You can also download this practice as a pdf to print out. It will be easier to see and fill out the practice tables on paper, especially if you are reading this from a mobile phone. Right click here to download. The introductory paragraphs show examples of how many of these words are used. For related vocabulary, see Personality Vocabulary, Political Language, and Understand the News in English. Home> Learn English Vocabulary> 20+ Words for Truth, Falsehood, and Error.